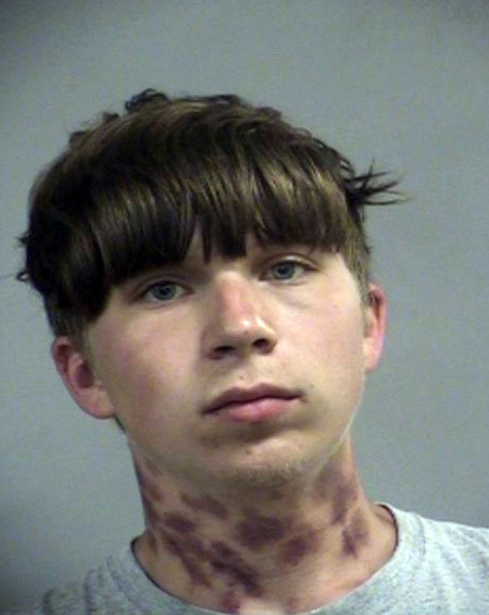 A Kentucky teenager arrested this week appears to have set a new U.S. record for hickeys. Micah Musser, 18, was arrested yesterday morning after Louisville police discovered him and several juvenile runaways inside an abandoned building. Musser and the minors were found laying on the floor, which was strewn with “empty alcoholic beverage containers,” according to a court citation. Musser told cops that he and the minors had consumed the alcohol after gaining entry to the boarded-up property the prior evening. Charged with criminal trespassing and unlawful transaction with a minor, Musser was booked into the Louisville Metro Corrections jail, where the adjacent mug shot was snapped. He is scheduled for a June 13 arraignment on the misdemeanor charges. The citation offers no details as to how Musser obtained the apparent hickey swarm on his neck. Based on photos uploaded to his Facebook page in late-April, Musser’s hickeys appear to be of recent vintage.